When residential home prices really began rising across Canada ten years ago, building contractors found themselves quoting prices for home additions, attic reclamation and basement remodeling. Homeowners couldn’t ignore the potential revenue and in many cases their mortgage depended on making a second apartment in the basement. In Oakville and Burlington, where real estate prices are also on the rise, Eastview Homes is here to make draft plans and help property owners double the size and value of their domiciles. With regards to home additions, attic reclamation and basement remodeling, all three of these separate initiatives can add livable space to a house and increase any building’s comfort and capacity, but basement renovation is probably the first and best place for homeowners to focus their attention if they’re seeking to add value to their property. This blog post documents a rather unique-looking yellow concrete basement space that would certainly be considered ‘unfinished’ before Eastview Homes arrived on site. Our building manager Keith Travers is particularly passionate about basements. After an initial meeting on site, Keith often convinces the homeowner to adopt his straightforward and sensible visions for their new subterranean space. Twenty years ago, basement remodeling was done to add an extra bedroom to a house, or to make another place for kids to play. When setup with foldaway beds and closets, a dual purpose basement room can shelter an expanding family, or be a comfortable guest room for visiting in-laws. The basement living room is also the best place for a dimly lit home theatre with a surround sound system that might otherwise cause disturbances if above ground. While adding a basement bedroom is still common, homeowners are now expanding their options. Keith now regularly designs and installs home theaters, swim spas and personal museums with racks of collectibles under glass in the walls. He worked with Rosehill Wine Cellars to make wine cellar in Mississauga in the autumn of 2018. Basements can also become playrooms for adult children who build model train sets or set up elaborate home studios to shoot YouTube videos. As seen above, another old-fashion building trend that is now quite obsolete is the basement safe. In the early 1900s, many suburban homeowners were encouraged by bank managers to put a firebox lock box in their houses. The iron box, often sold by the bank itself or a firm directly related to the bank’s operations, was to be kept in the basement and if possible anchored into the wall itself. If installed properly in the wall, the safe was fireproof. The home safe was considered the ideal storage place for property deeds and other valuable documents. This crude solution above was fashioned by a previous homeowner, and presents only an illusion of security. The top of the ‘cement’ casing is made of wood! Simply rapping your knuckles on the top of the container confirms its wooden composition and as such it could be removed with a single hammer blow. Want to Create a Fully Functional Basement Apartment? Eastview Homes can create full apartments with kitchens, bathrooms, bedrooms, and fireplaces complete with a separate entrance into the space. 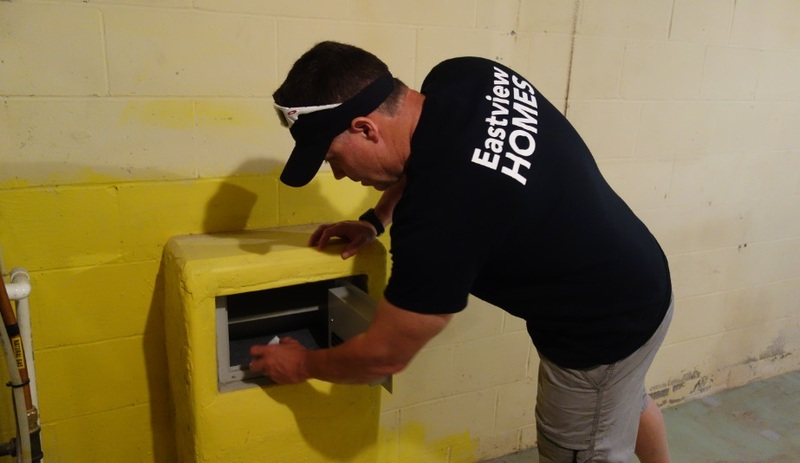 Finishing basements – Eastview Homes also offers a comprehensive service list for transforming dark walls and damp flooring of an unfinished basement into a warm and cozy living space. We are experts at designing dry basements. Experienced drywallers and sheetrock installers take special precautions with vapor barrier membranes to lock out moisture. Our painters take special care to protect and coat difficult areas like ceilings, casing, baseboards, and moldings. We offer several flooring options and including premium laminate flooring, tiles or carpets. Homeowners often tell us that the main reason they are looking to renovate is to create a basement family room. While many homes have a relax area on the main floor, it is often very small and not always an ideal venue for larger toys and games, especially games like ping-pong or physical games that younger kids play. Stay tuned to the blog to see this basement space transformed into a beautiful home theatre.